Andy Murray kept his campaign on track with a dramatic late-night win over Stanislas Wawrinka as Wimbledon witnessed its first floodlit match. 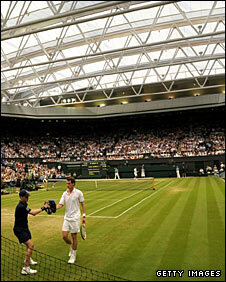 The fourth-round contest was played under the new roof after a rain shower. And the Scot battled to a 2-6 6-3 6-3 5-7 6-3 win in three hours 56 minutes, with the end coming at 2238 BST - the latest Wimbledon finish. 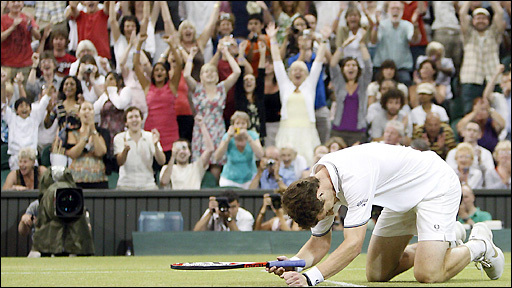 Murray was outplayed early on but recovered to set up a quarter-final against wildcard Juan Carlos Ferrero. 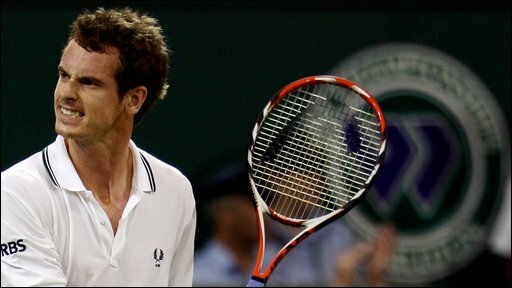 "It was pretty special, I thought Stan played a great match," Murray told BBC Sport afterwards. "The standard he set at the start was tough to keep up with. "He was playing great and he came out with some big shots. In five-set matches there are these momentum shifts sometimes. "It was great, always when you play indoors the atmosphere is great, but when you've got 15,000 supporters it makes it extra special, so thanks a lot." The 22-year-old from Dunblane is trying to become the first British man to win the Wimbledon singles title since Fred Perry in 1936, and the first Scot ever to win a Grand Slam singles title. Murray and Wawrinka had met seven times before, with the Briton holding a slender 4-3 lead, but he had won the last two and thrashed the world number 18 last time out at the US Open. After Dinara Safina and Amelie Mauresmo had become the first players to play competitively under the roof in the previous match, the men were the first to start a match in the new conditions. In the unusually echoing surroundings of the now indoor Centre Court, Murray received a huge ovation as he came out to serve, but Wawrinka made the stronger start as he got to 0-40 and converted his fourth break point of the opening game. If that could be put down to early nerves, the situation got more serious when Murray thumped a backhand well over the baseline to fall two breaks down at 3-0. Can Murray win the title? There was the first sign of nerves from Wawrinka when successive double-faults offered up a break-back point in game four but Murray could only find the net, and the chance to get a foothold in the match disappeared. A first-serve percentage of below 44% and no aces was a dramatic decline from previous matches, while Wawrinka grew in confidence as he served out a set he had totally dominated in 34 minutes. There was a huge cheer after Murray held comfortably at the start of the second set, but he was in deep trouble after the Swiss got to 15-40 at 2-2 with a killer drop shot and an unplayable forehand. The first break point went begging quickly enough before Wawrinka then went just wide with a forehand, and when Murray unleashed a forehand cross-court winner on game point there was a palpable release of 58-minutes' worth of tension from both player and spectators. Wawrinka received attention to his left thigh on the changeover before game eight, which then proved to be a key game as Murray finally earned two more break points, converting the second when Wawrinka put a backhand wide. Murray screamed in delight and powered through the next service game to love, taking it with an ace to level up a match that had been in danger of slipping away. There was no let-up in the tension as the third set began, and Murray's first-serve percentage had slipped to 32% when he offered up three break points in game six. The Briton was very fortunate that Wawrinka let him off the hook with three unforced errors, and he soon made him pay. Wawrinka had a lapse of concentration in the following game and Murray pounced, moving to 0-40 and converting his second break point by forcing the Swiss to volley long, and a second break followed soon after as the 19th seed's game temporarily disintegrated. With the light fading outside as the time approached 2100 BST, there was no danger of the match ending early as the new floodlights ensured play would go on for as long as necessary. Again it was Murray who faltered first in the fourth set, a poor forehand giving Wawrinka 30-40 at 3-3, but the Swiss sent a forehand long to waste a ninth break. With the floodlit contest now effectively a night-match, like those seen at the US and Australian Opens, Murray had a break point to serve for the match but netted a forehand and Wawrinka kept the contest alive. The Swiss then let a chance slip in game nine but finally made the breakthrough on his 13th break point of the match to lead 6-5, and he served out with an ace to force a decider at 2153 BST. Murray grabbed the initiative in game two of the final set when Wawrinka netted a volley but the Swiss came storming back with three straight games to level at 3-3. Outside Centre Court, thousands of fans remained glued to the action on the big screen despite the total darkness, and their man urged those inside the 15,000-seater arena to give greater support in a dramatic eighth game. The world number three netted on two break points before he set up a forehand on the third and cracked it down the line to a huge roar from the crowd, and Murray then threw in a stunning drop shot before surviving a tense Hawkeye challenge on his way to serving out an extraordinary victory. "I'll have a pretty deep sleep tonight after that," said Murray. "After a match like that you take a lot of confidence, it was a great day."